Ireland’s Claire Kinsella shields the ball from Susana Gabriela Munoz Soto of Mexico in opening round of Women’s Football. 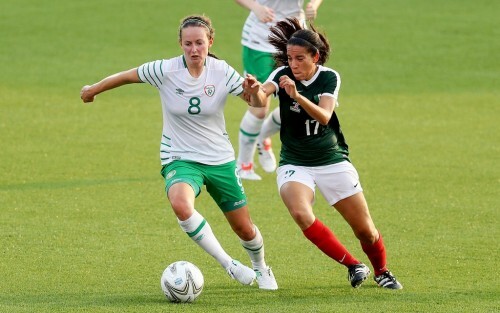 A solid defensive display from Ireland saw the girls in green share the spoils with Mexico in the first game of Pool B of the World University Games Women’s Football competition in Hsinchu County Second Stadium. On a warm humid afternoon on a freshly laid astro pitch, the Mexicans adapted better to the conditions and were on the front foot from the off in this contest, however they were met with a wall of top class defending from Ireland. The Central American’s tested hit the woodwork on two occasions in the second half and Irish keeper Amanda Budden was confident in making several great saves and collecting some dangerous crosses. Amber Barrett looked to have raced in on goal midway through the second half but she saw the ball race away from her feet just as she looked to pull the trigger with the Mexican keeper snuffing out the danger. A draw and a point for both sides on the table after one game sets both teams up nicely in the group, with Colin Bell’s Irish side’s next opponents in the group Canada on Sunday morning at 9am Irish time. Ireland: Amanda Budden (Cork IT), Jetta Berrill (University College Dublin), Shauna Fox (NUI Galway), Chloe Mustaki (University College Dublin), Claire Walsh (University College Dublin), Orlagh Nolan (University College Dublin), Claire O’Riordan (IT Carlow), Eleanor Ryan Doyle (IT Blanchardstown), Rebekah Carroll (Maynooth University), Niamh McLaughlin (Northumbria University), Amber Barrett (Maynooth University). Subs Claire Kinsella (IT Carlow) for McLaughlin (Inj), Ciara McNamara (University College Cork) for Nolan, Aisling Frawley (Dublin City University) for Ryan-Doyle, also Eve Badana (University College Cork), Katie McCarthy (University College Cork), Ailbhe Clancy (Dublin City University), Emma Byrne (Maynooth University), Rianna Jarrett (IT Carlow), Aoibhin Webb (Dublin City University).